We sometimes hear the tales behind the making of Nintendo’s greatest games: the Zeldas, the Marios and the Metroids. Let us bend our ears for another tale, this time of the making of Gold Digger, a game about a finger interacting with a nose. Gold Digger was co-created by Goro Abe, a longtime developer at Nintendo who helped make the 2003 Game Boy Advance game WarioWare, Inc.: Mega Microgames, known more simply as WarioWare. The game’s plot involves the cantankerous Wario deciding to get rich quick by going into video game publishing and selling as many games as possible. The trick, he figures, is to make the games last about three seconds each. The games are simple and usually controlled by a single button press. One WarioWare microgame involves jumping rope, another pulling a shirt down over a bulging belly. There’s a microgame about jumping over a barrel midway up the board in Donkey Kong and one about catching toast as it pops out of a toaster. And then there’s Gold Digger, a game with a brief backstory that presents an unusually clear picture of how game design evolves. A good video game can start with an idea, develop into a game, then need some tweaking to get just right, even when it’s just a silly game about picking a nose. The notes Abe was referring to had been stuck to a whiteboard where WarioWare’s development team was working. The developers were trying to cook up ideas for hundreds of short games and had an internal rule to think up ideas, put them on sticky notes and put them on the board as inspiration. The best ones would make it into the game. Often, when a game is in development, the early playable versions that are created are too hard for first-time players. The designers focus on making a game that has solid mechanics and will hold up to sustained play. If they nail that, they can then tweak things to make them easier for players just starting out. Abe’s initial design of Gold Digger was indeed too difficult for beginners. He needed something easier, and he needed something that could be tuned to three levels of difficulty. 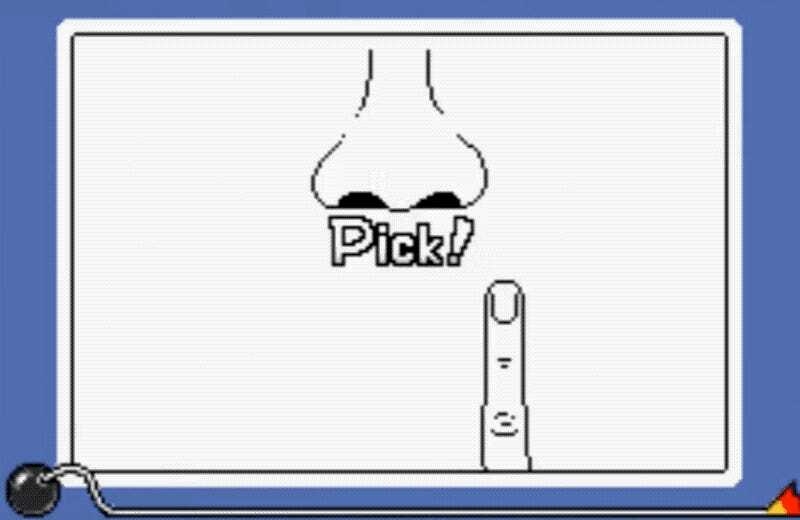 As players progressed in WarioWare they would encounter faster and faster versions of the microgrames, but Abe didn’t want the game’s nose-picking challenge to get tougher just by putting it in fast-forward. 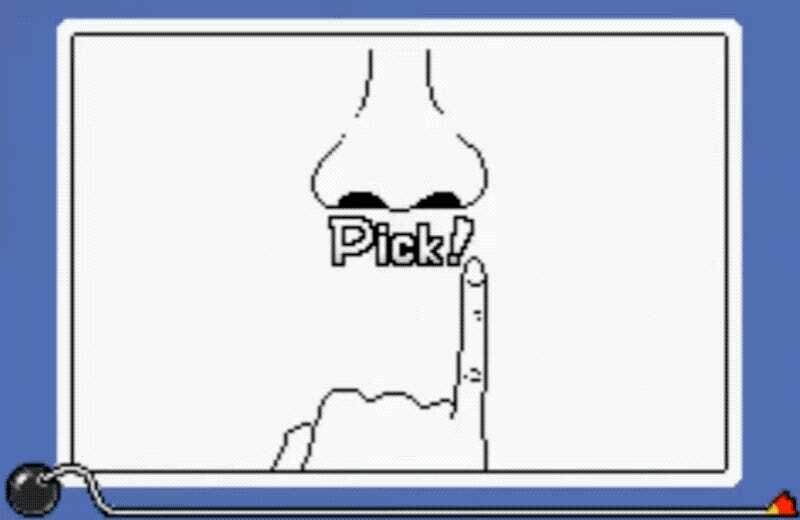 So, how do you make a game about picking a nose easier? Look at your hand for the answer. Gold Digger’s chunky forefinger left little margin for error. A pinky, however, might leave some room for a badly-timed button press, which covered the easiest of the three difficulties. What could work for the hardest difficulty? A double-pick, of course. A nose-picking game is silly, of course. Maybe, to some, it’s gross. It’s also refreshingly universal. Abe noted that the goal for the microgames was that they had to be “instantly understandable” and that they should be things that “anybody in the world can understand.” In that regard, Gold Digger is a crowning achievement. It’s hard to imagine anyone on the planet who wouldn’t know what to do when confronted with a moving finger, a nose and a button to press. I mean, they might tell you they didn’t immediately know what to do, but come on. They did. This year’s WarioWare Gold on the Nintendo 3DS includes remade and remixed versions of classic microgrames. Its version of Gold Digger features multiple noses, some fake-outs and other twists. We’ll have more about WarioWare in the coming days, as Abe talks to us about the creative decisions behind the newest release in the series, this summer’s WarioWare Gold.